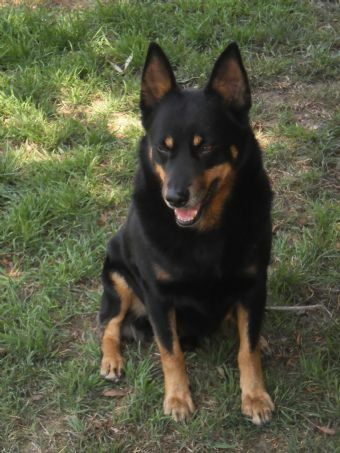 Drover has just had his birthday he is now 11 years old. Still a good looking dog. His last litter, the pups now seven months old, are lovely dogs with good balance and working instincts. 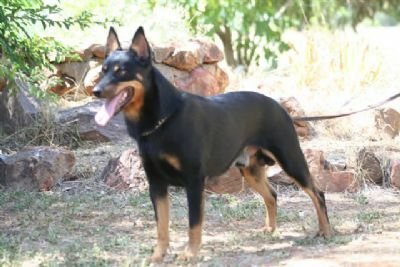 This lovely black/tan boy has sired beautiful red/tan and black/tans dogs. One of his daughters is already an Australian Champion and another young red/tan dog is now out being shown. Behind this young dog in his pedigree are some of the best, true to type old dogs that truely depict the sound dogs from the past. 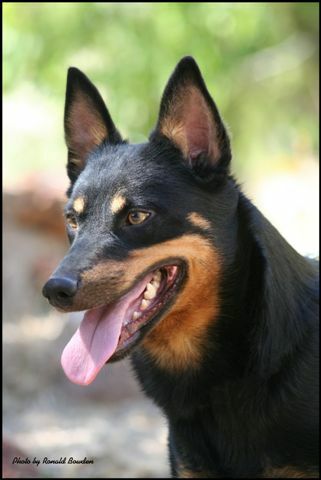 Many of the judges today have not seen good red/tan or black/tan Kelpies. Drover's sister "Missy" who is a lovely red/tan also has a wonderful temperament. Both of these dogs have great length of leg are sound and can move with great speed and ease over the paddocks. Just like watching a feather float across the ground.